Matthew tries not to cough. He rolls the cigar smoke around his mouth the way his Dad does, and exhales. 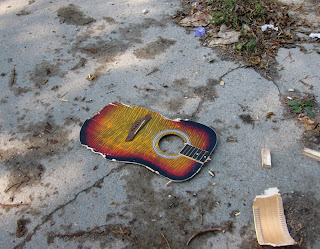 His new guitar is resting on the curb beside him. Matthew worked all summer at Popeye's restaurant to buy it. He came home every night smelling of grease. His bedsheets and towels were sticky with oil. Mom complained when she did the laundry. Popeye's sucked. Matthew got a rash on the back of his neck from the polyester uniform shirt, and he was too exhausted after work to ever go out with his friends. But it didn't matter because he was going to buy that guitar. Matthew stubs out the cigar leaving a black smear on the concrete. He itches the raw spot on the back of his neck. His fingertips come away bloody and he lights another cigar. At work he would watch the strips of potato bubble in the grease as they whirled and spun. He'd scoop the fries out of the oil with a metal basket, rescuing them. He imaged what would happen after he bought the guitar. Dad would take his own Gibson out of the closet and the two of them would play. In between songs, Dad would tell stories of the old days on the road before he gave up music and started working at the tire factory. Then they'd toast to the future. Father and son. But this afternoon, when he finally had his new guitar, everything happened differently. Dad was in the den with one of the headaches he often got from the rubber tire fumes. When Matthew switched on the light he said: "Turn that off. You trying to kill me?" "Dad, I got something to show you," Matthew said. He opened the case and pulled out the guitar. "Millers. I've been saving all summer." "Well you've wasted your money. Now switch off that damn light and leave me in peace." Matthew escaped into the backyard, carrying the guitar. He wiped his tears with the back of his hand and pulled out the package of Colt's. When all of his Dad's cigars are smoked, Matthew feels like throwing up. Instead, he stands and picks up the guitar. He smashes it against the pavement again and again, shattering it to bits. He turns and heads inside, leaving the pieces of wood scattered in the alley.